Sorry for the delayed podcast post, a member of our crew’s significant other gave birth to what appears to be a human so we had to shift duties. This is probably our longest cast yet, we absolutely ruin Avengers: Age of Ultron and Daredevil with a smattering of other topics. Enjoy! Welcome back faithful listeners. Podcast 12 is now available. From now until September 4th Capcom is offering select titles for 60% off, on both the Wii U and 3DS. If you are following along on our Monster Hunter Wednesdays via the Podcast or our Twitch stream, now is the perfect time to check the game out as they are on sale for $16.99 for the Wii U version, and $19.99 for the 3DS. Why the price disparity, I couldn’t tell you. Personally I’m only a little bitter I picked up the physical Wii U version for $22 little over a week ago..
You can pick these up via each platform’s E Shop. Check after the break for a complete list of titles included in the sale. Holy bang for your buck Captain Rainbow! 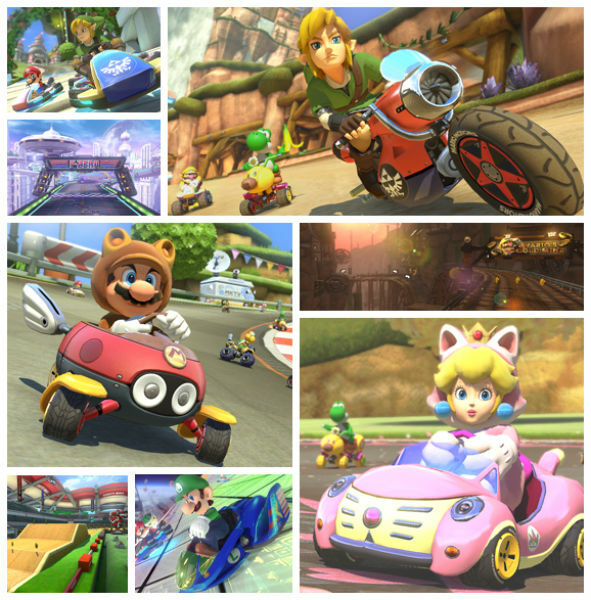 Ahead of the incoming Mario Kart 8 patch that includes new features and Mercedes DLC carts (free of cost) Nintendo dropped news of their DLC strategy for Mario Kart 8. This has surpassed my expectations in just about every way. TL;DR 16 new tracks, 8 new cars, and 6 new characters at either $7.99 for each of 2 packs or $11.99 for the pair. Hit the jump for the full lowdown on what is included so far. Looks like the Pokemon craze is taking on the fighting game genre in arcades with Pokken Tournament. It will make its debut in (likely Japanese) arcades in 2015, hopefully a Wii U port will follow! Video Link, Official Pokemon Channel. I see that I am an extremely rare individual these days, in that I actually like surprises in my games from time to time. Surprises can be fun! Well, with the most recent leak of the Smash Brothers roster we have all had yet another opportunity for a surprise stripped away from us. To put it into perspective for those who cannot follow my line of thinking, remember when you found out that Magus was playable in Chrono Trigger? Remember that time in Jet Set Radio future when you somehow unlocked the GG’s dog as a playable character? Those kinds of surprises were why you played the games! This kind of surprise is basically dead thanks to the inevitability of these leaks brought on by the internet and its role in our society. In all seriousness, the guy who did this is beyond screwed. When/if he is found by the Nintendo Secret Police he will be fired and probably fed to sharks. When you sign a Non-Disclosure Agreement (NDA) you are under the threat of severe penalty for running your mouth to the wrong group of people. The likely scenario of what is going to happen is that he/she will be fired (least of their worries) , sued straight into oblivion, and blacklisted in the industry. While many people are happy to receive this info, it was an extremely poor decision to leak it and this individual’s life is about to be miserable long term for 15 minutes of internet fame. Mega corporation Amazon.com is in the process of acquiring Live Streaming service Twitch.tv for approximately 1 billion dollars. Twitch will be joining the E-Commerce conglomerates family of services and store fronts including Amazon Web Services, Audible.com, and recently acquired electronic comic book dispensery ComiXology.com. This comes as a shock after the rumors of a Google/YouTube acquisition of Twitch the past few months caused many members of the Twitch community to be nervous, as it appeared Twitch was gearing it’s service to more resemble YouTube by implementing ‘features’ that scour videos to block copy written material. Twitch.TV CEO Emmett Shear, along with the Director of Community Marcus Graham and Mike Frazzini the VP of Games at Amazon.com streamed an Amazon/Twitch Discussion Q&A directly on Twitch in which they thank the Twitch community and go on to say Twitch will continue to remain independent, while being able to take advantage of all of the expertise and features Amazon will be able to offer.